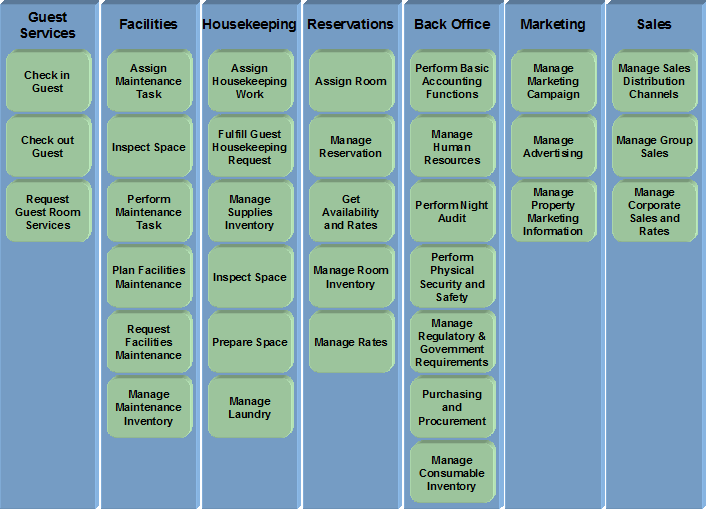 Home/Enterprise Architecture/Business Architects: What’s at the “core”? Nick, to me the term core, in the physical sense, is the "centre" of something. In the abstract sense, it means the "central" function of something, that is the more important part. Anyway, since most models have no physical centre, unless they are round or there about, the abstract sense prevails. For most people it means "key", that is the most important thing or things in a system of things, for instance the key (or core) processes of an enterprise. Still, depending on viewpoint, the most important part of model could be the shared functions. Or it could be the " manufacturing" etc. 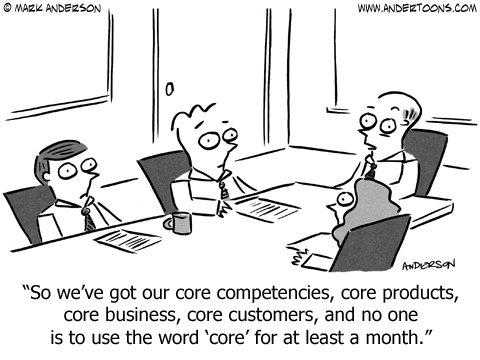 Alex: unfortunately the word 'core' is baked into some of the terms we use, so I may have to use the word, and quickly define it, as I go. Adrian: I think you modeled the problem well. Unfortunately, the one person that I fail to communicate with may end up being the most critical somewhere down the line. So counting on logic or deferring to what "most people" believe can be hazardous. Nick, in any case, since core means central in one sense (physical) or another (abstract) you were right. It is true though that the most important function might not be in the physical center or too often there is no physical center. In fuzzy cases then, you may qualify "core" by adding the sense, abstract or physical. Anyway, in my experience, there is no 100% agreement ever. There will always be some who disagree since they have a different view, a more mechanical thinking or reasons to disagree with you, such as dislike or show off, rather that with what you say. Say you use term "key" for instance. Some mechanicists may think then that you are speaking about a door. But that's the nature of language. It is rare the word that has a single meaning. The meaning has to be taken in the semantical context. That's what speech recognition is about. I hope you don't discount logic or what the majority says because somebody may disagree with you down the line. For simplistic strategic frameworks like OCHA, concentric rings show best the convergence from objectives to goals. So naturally, core not only means important but also central. For Value Chains where there is a natural sequence, core means key/primary processes because there is no physical centre anyway and perhaps they are all at the center of the enterprise functionality. What is worth debating though is what is core in the context of "core competencies" of an enterprise, how are they different, if they are so, from core capabilities and if they are all outsourceable. Context is any activity that does not differentiate the company from the customer's viewpoint in the target market. Context management seeks to meet, but not exceed, appropriate accepted standards in a productive a manner as possible. In my consulting work, I tagged on "Commodity" to the list and ask the clients to force prioritize "Core capabilities" "Context capabilities" and "commodity capabilities" with the idea that you invest into core, standardize the context, and outsource the commodity. Shared is not the opposite of core. So, I think there is no harm in sharing the core.